When is a selection of new music like a flower garden? Right now, actually. Cultivate your music collection with new songs by Clem Snide and others. With the year barely one-quarter old and the ravages of winter not quite a distant memory, there is plenty of budding already occurring, on the stem and in the ears. New songs are cropping up with the same frequency and intensity as the colorful carbon-based life forms that have begun appearing all over the neighborhood. As in the garden, some of the musical flowering is expected — though no less marvelous — as favorite perennials faithfully deliver new blossoms once again. There are a few unexpected beauties, too, both from those we thought incapable of blooming again and the wild ones we’ve never encountered before. And, as always, there are plenty of novelties, confections, and the odd hybrid or two sure to satisfy any garden-variety music harvester. There’s so much to get to, in fact, that this week I will spare you the usual literary cultivating and cut to the arrangement. Best of all, thanks to the magic of a recent upgrade, we can now let the songs speak for themselves. Following each brief description you’ll find a play button. Just pick, click, and enjoy! Also, be sure to click on the many links below for additional info (open each as a new tab or window), and then follow the threads to find out where you can download or purchase the songs. Or you can listen to a playlist that features these songs and others at the Scribbleskiff page on the 8tracks Web site. Just click HERE, open as a new tab or window, and let the music play as you read along. “Awake My Soul,” Mumford & Sons, Sigh No More. These guys had me at “hello”: Any song that opens with the words “fickle” and “woozy” is a keeper in my book. Especially on an album that steals its title from Shakespeare. Though starting slowly, like an Avett Brothers ballad, “Awake” morphs into an acoustic rocker that rivals the best of The Waterboys and would rouse any sleeping psyche. “Castaways,” Shearwater, The Golden Archipelago. At first, Jonathan Meiburg’s vocals on this track remind me of Bryan Ferry’s. But it becomes quickly apparent that he and his group forge music with much more grandeur and gravitas than anything dreamt of in Roxy Music‘s philosophies. In fact, I imagine this song could serve as the official dirge played upon arrival at the shores of Avalon itself. “Modern Drift,” Efterklang, Magic Chairs. Although I’ve never heard of this Scandinavian group, I do feel like I’ve heard this song before. Or at least it sounds familiar — the trilling piano swirling throughout could come from a Philip Glass composition, for instance, and the strings and vocals follow the romantic sweep of Arcade Fire. But it’s their ability to combine the old-fashioned and newfangled that makes it feel unique. “The Mall and Misery,” Broken Bells, Broken Bells. I’ve always wondered what it would be like if members of The Shins and Gnarls Barkley collaborated on an album. Actually, I’ve never wondered that, but at least I now know what it might sound like: Broken Bells. And despite the name, James Mercer’s shimmery vocals and jangly guitar-work here chime sweetly with the street-savvy rhythms and club-dub effects of Danger Mouse (aka Brian Burton). “Laura Palmer’s Prom,” You Say Party! We Say Die! XXXX. Any fan of Twin Peaks will immediately recognize the literal and aural allusions to David Lynch’s classic TV drama in this song, from the name-checked murdered high-schooler to the creepy synths of Angelo Badalamenti. But this Vancouver-based five-piece keeps the tributary nightmares at bay with heavy doses of dreamy New Wave dance-beats straight out of Sixteen Candles. “There Are Listed Buildings,” Los Campesinos! Romance Is Boring. Not just another group with an exclamation point in its moniker, these seven Welshmen earn the right to sport their punctuation. They play a high-octane form of power pop I’d call “soft-core punk” — pounding drums, running bass lines, group shouting, and plenty of catchy guitar hooks — but with just the right mix of restraint and mellifluence to make it a joyful noise. “Walls,” Shout Out Louds, Work. This Swedish group appeared on my radar in 2007, and I immediately fell for their ersatz ’80s sound — an impure Cure, if you will, jittery and atmospheric but slightly more upbeat. They’ve become rangier since then, as this single shows, less imitative, more complex and weightier instrumentally. But it’s still positive, elegant, and instantly likable pop music. “Written in Reverse,” Spoon, Transference. Ever prolific, though often erratic, Spoon has always seemed like an indie-rock version of NRBQ to me: A Brit-pop-influenced American roots-rock band that, when they’ve got rhythm, is hard to be beat. And this cut, from their seventh studio LP, is a case in point. It’s terse and moody, yet bursting with energy and groove appeal that gets me moving, in either direction. 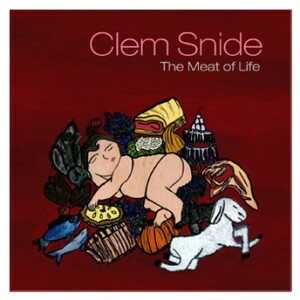 “The Meat of Life,” Clem Snide, The Meat of Life. The group Clem Snide, as you might expect from their name, has been making edgy, slightly arch, alt-county-esque records off and on since the early 1990s. I say “off and on” not because they’re inconsistent (they’re solid, actually) but because every now and then they break up. Which likely explains the restiveness. Thankfully, though, they’re back together again and up to their same old tricks. “Swim Until You Can’t See Land,” Frightened Rabbit, Winter of Mixed Drinks. As one of the first bands I covered at Scribbleskiff, Frightened Rabbit glows in my memory like an old flame. (Truthfully, as I admitted here, I’m as much a sucker for a Scottish brogue as I am a fan of lush, melodic arrangements.) Encountering them again, a few years later, I’m delighted to report that I’m not always prone to confabulation — they’re as good as I once thought they would be. So, there you have it, a bouquet of 10 new songs offered to brighten up your spring. It’s also an offertory in honor of Record Store Day, which takes place this year on April 17. According to officials, Record Store Day is set aside “in celebration of the unique culture surrounding the more than 700 independent record stores in the USA” and similar stores around the world. Depending on the venue, festivities often include cookouts, live performances, meet-and-greets with local musicians, and more. Check the site to see what’s happening in your area. I know I will. As faithful readers of this blog can attest, I may talk a lot about downloads and online music, but I’m an old softy when it comes to buying and collecting vinyl records. As always, tell us what you think. Have you ever heard any of these songs yet? Which are your new favorites? Or are there other new releases that you think everyone should be listening to? Let us know by leaving a comment below. Tagged as: awake my soul, Broken Bells, Castaways, Clem Snide, Efterklang, Frightened Rabbit, indie music, Laura Palmer's Prom, Los Campesinos!, Modern Drift, mumford and sons, new music, Record Store Day, Shearwater, Shout Out Louds, skribbleskiff, Spoon, Swim Until You Can't See Land, The Mall and Misery, The Meat of Life, There Are Listed Buildings, vinyl, Walls, Written in Reverse, You Say Party! We Say Die!